Scale is fundamental to urban design. If you get it right, and achieve a well-proportioned space between buildings, you have a sound basis to build upon. Even if the architecture is far from perfect, the public realm you create can be decent and comfortable. If you get the scale wrong and your master plan is built, even the most lustrous architecture won’t remediate the failure of space-making; people might still use it for utilitarian reasons (think the parking lot of a Wal-Mart), but will not enjoy it. Getting the urban scale right has been the mantra of planners and architects for ages. But have we been practicing what we have been preaching? In reality, we have been putting up for too long with the worst offender to human scale, sprawl. This pathological growth pattern has created environments of magnified dimensions that overwhelm the physical size of the human body. Massive thoroughfares, perfect for fast-moving cars but not for pedestrians, have destroyed our neighborhoods; mind-boggling multi-level interchanges have eroded our urban cores; single-use mega structures of enormous size and their even more enormous parking lots, have obliterated the walkable scale of traditional towns. This type of planning has resulted not only in the largest waste of real estate, infrastructure and natural resources in human history, but has seriously impeded some elemental human necessities – the need to walk based on the physiology of our two-legged bodies, and the need for spatial enclosure based on the physiology of our human eyes as well as our psychology. It is simple: we enjoy walking and we enjoy well-defined spaces, while sprawl has deprived us of both. It is ironic that the demise of human scale in urban planning started with Le Corbusier, who taught us in his Modulor that human dimensions should become the universal criteria for any type of design – from the height of the kitchen counter to the size and shape of an airplane. However, he accomplished something very different in his city-building practice – he introduced gigantism in urban planning based on the necessity to accommodate the movement and speed of cars. Chandigarh, his only built plan, is the implementation of the modernist urban utopia, “a painting on a clean canvas,” per Edmund A. Bacon, where both separation of functions and division of vehicular and pedestrian traffic were instituted. The mega-grid created a strong, memorable diagram; the sculptural quality of Le Corbusier’s civic architecture delivered the grandeur of the image. However, Chandigarh’s scale is car-oriented; its street network is a highway system, with buildings pulled away from the streets, not shaping the streets into spatial enclosures. The Athens Charter of CIAM (mostly written by Le Corbusier) explicitly calls for the use of human scale in all urban planning matters (Conclusion 76 “ The dimensions of all elements within the urban system can only be governed by human proportions”), but in Chandigarh Le Corbusier did not apply this requirement literally. He carried through the monumental scale of the overall urban diagram, but failed to achieve the smaller, human scale. Today most of our cities and suburbs repeat the mistake of Chandigarh, ignoring the ways people have been living and socializing for thousands of years in pedestrian-scaled, compact, and diverse environments. These places are sick with a virus that could be called “mega-scale” or as Jan Gehl defines it, “The Brasilia syndrome”. 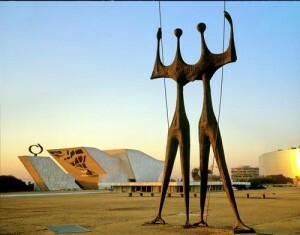 In Brazil’s capital there is a centerpiece called “The Square of the Three Powers,” designed by a follower of Le Corbusier, Lucio Costa, with buildings by Oscar Niemeyer. The ensemble is an astounding accomplishment of civic pride and symbolism, similar to the grand metrics of Chandigarh. As a main square of the capital of Brazil, its oversized dimensions are suitable. But seeing the pair of gigantic “Candangos,” or “The Warriors,” a metal sculpture at the square, symbolizing the people who built the place, I couldn’t help thinking about scale. I could barely touch the knee of one of the giants. It seemed that the square, as many other places in recent urban history, were created for these metal “avatars.” Towering four-fold over a normal person, they were the only ones who looked comfortable in this vast space. The square and the sculptures are appropriate for their location and function, but they remind us that in urban design large scale should be reserved for the civic and the monumental, while human scale should prevail over most of the urban fabric. We need to reclaim smallness, by “shrinking” the scale to fit our species’ size. Over the ages our minds have evolved more than our bodies. Actually, according to Wikipedia, “the appearance of modern man about 100,000 years ago was marked by a decrease in body size at the same time as an increase in brain size.” Yes, since then we have grown in height compared to the medieval knights; however, the difference is measured in only a few inches that are far less significant than the oversized, car-oriented dimensions we have chosen for ourselves while building sprawl. Today we acknowledge the mistake and the challenge to correct it. Let’s hope our larger brains will help us return to the smaller scale.